I've been intending for my next post to be about food. Food and exercise are the two areas I'd like to focus on in this blog as they form the foundation of my transformation and ultimately of how I like to live my life. I've been a vegetarian since early February. Before that I was trying my best to only eat meat from "sustainable" sources, but I found this to be more thorny ethically than I thought. For anyone considering a vegetarian or vegan life I'd recommend the book "Eating Animals" by Jonathan Safran Foer as a good starting point. Beyond the ethical reasons I've decided not to eat meat, I also feel that eating a plant based diet allows me to eat a greater quantity of food and has forced me to consider a greater variety of food as well. One point I'd like to stress is that just because what I did worked for me, it doesn't mean it will work for anyone else. I read a blog called Weighty Matters that just did a great post on this topic. I've also started talking to some friends on Facebook about this blog. One friend expressed his trouble finding motivation and how to fit things in between school and work. My partner's Mother is also struggling with motivation right now. I told her that right now in her life she should pick either exercising or food to focus on right now and commit to one thing at a time. Most of the people I discuss my lifestyle with have a mindset that they will "diet and be good" as long as they can. I made the decision to change my entire life and make healthy living a foundation rather than something I do when I can. Another friend wrote a comment that "One has to make eating well and exercise a priority. Some thing that you plan other things around rather than something that you do if you get around to it. This is HARD since it is not the way most of us are wired." I think this nicely sums up what I said previously. One thing I've done recently is started to look at my 5 day per week exercise goal and figure out how to make it more fun and less routine. I have several go-to activities (running, weight lifting, hiking & home workouts) that I cycle through during the week. On the weekend I like to try to do different things (if time & money allows) like kayaking, longer hikes, climbing, and rollerskating. I also try to take a 10-15 minute walk every day during my work day, and on my "off" days from exercise I try to take the dog for a nice long walk. This has helped me avoid some of the monotony and still feel motivated and excited about my activities. It seems I've strayed from the food topic again, but I did want to post a few food related things. We went to the local farmer's market on Saturday and bought corn, zucchini, tomatoes, pole beans, new potatoes, and kale. When we got home we laid them out on the table and took out the other produce we had plus the grains we had in the cupboard. We planned our meals for the week based on what was fresh, local, and on hand. It felt good. 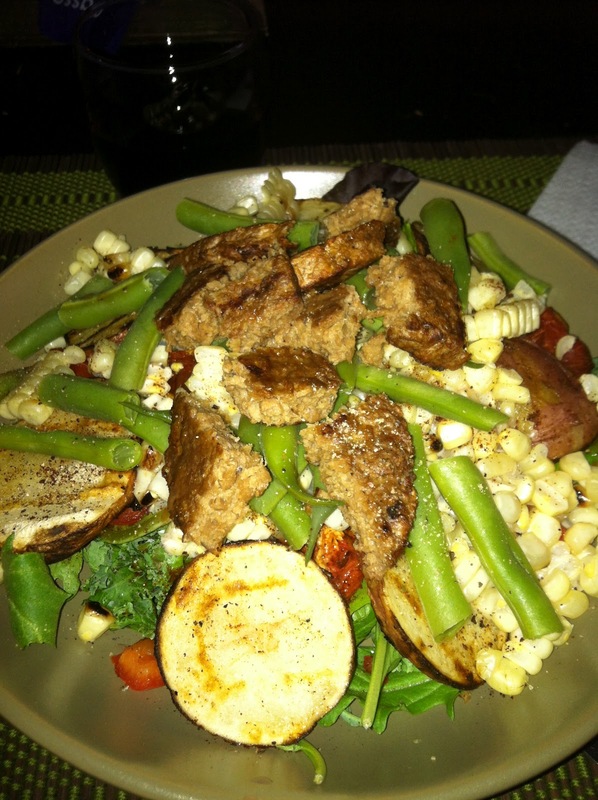 Our Saturday night meal was a killer salad made from grilled corn & new potatoes, chopped kale, steamed pole beans and a vegan burger. Sunday we made a barley salad with the grilled corn, diced red onion, roasted cherry tomatoes, red cabbage, and kale. 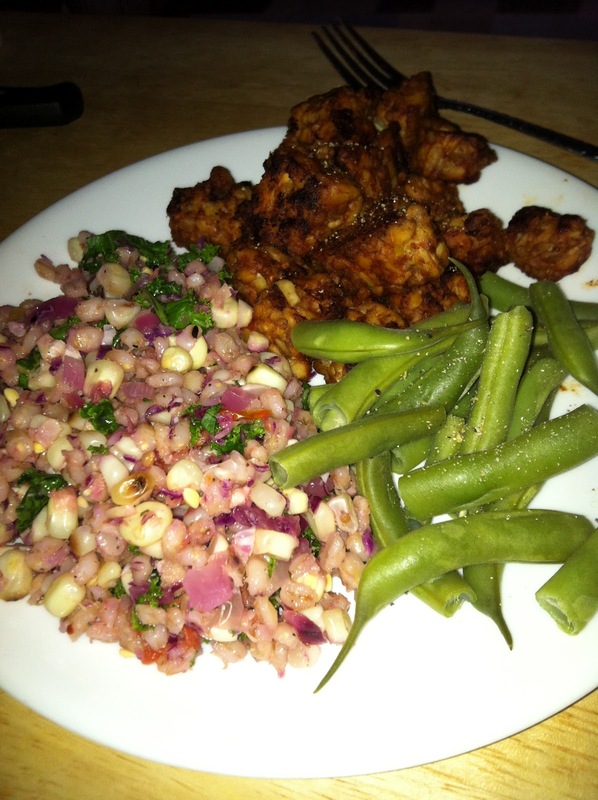 I paired mine with BBQ tempeh and my partner had BBQ chicken. We also ate some leftover pole beans. 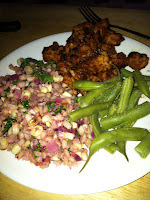 Last night I made one of our favorite dishes that I like to call MexiQuinoa. Here's a recipe! 1. Soak quinoa for at least 30 minutes in water. Drain & rinse in a colander. 2. Combine quinoa with 1.5 C water, garlic powder, chili powder, salt & pepper in a saucepan and bring to a boil. Reduce heat to low and shake the pot often to keep quinoa from sticking to the bottom. The quinoa will take about 15-20 minutes to finish cooking. 3. While the quinoa cooks, saute the red onion for 3-5 minutes until it starts to get translucent. Add in the zucchini and jalapenos and cook 2-4 minutes. Add in your can of beans and the salsa. Reduce heat to low and let the ingredients cook together while the quinoa finishes. 4. By this point your quinoa should be done. Fluff it with a fork/spoon/spatula, then add it into the skillet with the veggie and bean mixture. Stir several times to combine. 5. Add a portion to a bowl, top with anything you'd like, and enjoy! I ate my serving with 1/4 C fat free shredded cheddar cheese and a small handful of scallions.